One of the most frustrating things about this General Assembly session was once again what lawmakers did not do. They actively chose not to join the 31 other states that have expanded Medicaid under the Affordable Care Act, not to provide health care coverage for several hundred thousand low-income adults who are currently uninsured, not to create thousands of jobs over the next ten years and not to help struggling local hospitals stay open. Gov. Pat McCrory has waffled some about expanding Medicaid but never come up with a plan. Legislative leaders have remained steadfastly opposed, putting their dislike of President Obama above access to health care for people they represent and the jobs expansion could create. That doesn’t mean legislative leaders didn’t talk about Medicaid this year. They talked about it plenty, repeatedly touting the merits of the “reform” plan they passed last year and boasting of an unprecedented surplus in the Medicaid budget thanks of course to the decisions they made and the stellar management of McCrory’s Department of Health and Human Services. First, consider the reform that divides the state into three regions and allows out of state for profit managed care companies to compete for Medicaid business with doctor or hospital led organizations like the highly successful Community Care of North Carolina. As Dr. Robert Bilbro recently pointed out in a column in the News & Observer , the work of Community Care and its network of nonprofits that operates in all 100 counties has resulted in an eight percent reduction in the per capita cost of Medicaid from 2010 to 2015, a savings unmatched around the country. Medicaid in North Carolina was not broken at all as lawmakers and advocates for privatization incessantly claimed. Past budget shortfalls came from inaccurate forecasts of enrollment growth, built in demands for unrealistic savings, and one time payments owed to the federal government. But the rhetorical stage was set for reform and turning some of the system over to for profit managed care companies, over the strong objections of most physicians who spoke against the plan at public hearings across the state. But what do doctors know about providing health care anyway? The state is now applying for a waiver from the federal government to implement the privatization reforms and there’s hope that the waiver process could somehow help build momentum for Medicaid expansion and that Gov. McCrory will finally come up with an expansion plan to present to the General Assembly and HHS in Washington. But don’t count on it. It’s not clear what reforms McCrory is citing, since the major privatization scheme won’t take effect until its approved by the federal government, which could take 18 months or more. As for the “chronically-troubled program,” that’s an odd way to describe a service that is covering more people for less cost per capita, as Dr. Bilbro explained. Most media outlets dutifully reported on the Medicaid surplus numbers without much explanation, but they are misleading too as Rose Hoban of N.C. Health News  pointed out. Most of the surplus comes from lower than projected enrollment and an increase in the federal matching rate for Medicaid. Last year the budget passed by the General Assembly included funding for an 8.3 percent increase in Medicaid enrollment, well higher than the enrollment increase in the last seven years—several of which were in the middle of the recession when the high unemployment rate made more people eligible for the program. As lawmakers were putting the budget together this spring, they not surprisingly found enrollment increases for the year closer to four percent, less than half of projections, resulting in huge savings. Add in the increase in the rate of matching state Medicaid dollars by the federal government they detest and you have almost two-thirds of the alleged surplus. Reforms had little to do with it. The folks running the General Assembly didn’t turn Medicaid around because it was never broken in the first place. They just unintentionally —or maybe intentionally—vastly over-budgeted for Medicaid enrollment and now are boasting that they are saving money and the state is running the program more efficiently. It does raise a couple of interesting questions though. If they have “fixed” Medicaid, why then should they turn it over to for profit managed care companies? And why not finally expand Medicaid and create jobs and provide health care for more people? 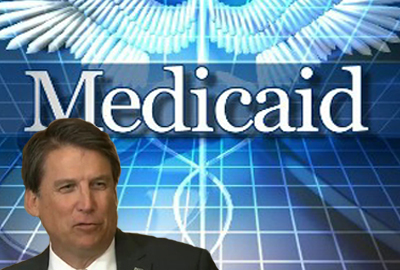 They can no longer use McCrory’s excuse that Medicaid is broken. The answer is ideology. Private for profit is always better than public or nonprofit even when the evidence shows otherwise. And opposition to every part of the Affordable Care Act, including Medicaid expansion, is still a rallying cry for the Republican base and it’s an election year after all. But at least they solved the huge Medicaid budget problem that didn’t really exist. Copyright © 2016 NC Policy Watch. All rights reserved.